Following The LEGO Movie – one of the biggest surprises to ever come out of commercialised product placement in movies ever – was always going to be a difficult, but not impossible, challenge. For one, Phil Lord and Christopher Miller declined to return as directors for this one – although they did remain as writers and producers – with Trolls filmmaker Mike Mitchell filling in that void, and the way that the first film ended, with the big revelation that [SPOILERS FOR THE FIRST MOVIE] it was all taking place in the imagination of a kid in the real world, left many wondering where this universe could go from there, especially with this bombshell that some would argue makes everything in the LEGO world utterly meaningless. Luckily, The LEGO Movie 2 manages to hold itself up well enough to serve as a solid sequel that’s certainly entertaining and often very funny, even though it never manages to entirely reach the heights that its predecessor managed to do. Picking up immediately where the first movie ended, with an army of Duplo invaders arriving in the LEGO city of Bricksburg – symbolising how, in the real world, the younger sister of the main kid has begun to bring her own toys into the mix – things quickly begin to unravel, and five years later the citizens of the re-named Apocalypseburg are hardened and weary of the invaders’ constant destruction; that is, except for Emmet (Chris Pratt) who remains his upbeat and optimistic self even when everyone around him, including his girlfriend Lucy (Elizabeth Banks), is off brooding. However, when a spacecraft from the Systar System carrying the masked General Sweet Mayhem (Stephanie Beatriz) arrives and kidnaps Lucy, Batman (Will Arnett), Unikitty (Alison Brie) and others, taking them to the shape-shifting ruler Queen Whatevra Wa-Nabi (Tiffany Haddish), Emmet takes it upon himself to venture far out in to the cosmos to find them and prevent “Our-Mom-Ageddon” from happening, with the help of the super tough and manly Rex Dangervest (also Pratt) that he meets along the way. Although Lord and Miller’s trademark sense of humour is still felt throughout the majority of the film’s irreverent and humorous script, this definitely feels like a film that was made by people trying very hard to copy their style, similar to how Cloudy with a Chance of Meatballs 2 – another sequel to a film that Lord and Miller originally directed – felt like a completely different creative crew being brought on to duplicate the exact tone, pace and overall feel that they brought to the original. That being said, replacement director Mitchell does a fine job with recapturing enough of the madcap zaniness that was established in the previous film, and the animation continues to be so wonderfully colourful and gorgeously rendered that it’s always at the very least pretty to look at. Lord and Miller’s script continues to be subversive, smart and more often than not very funny, though there are a few gags that don’t always land as well as intended; it is especially clever in how it incorporates these very different worlds – the LEGO universe that’s in the mind of this young boy (played by a returning Jadon Sand), and the more girly one dreamt up by his little sister (played by Brooklynn Prince, the young standout from The Florida Project) – into one great big metaphor for sibling rivalry, with the bright and sparkly world that the sister has dreamt up contrasting greatly with the boy’s, which has become much more toughened and moody (you could even say, like a world imagined by an angsty adolescent) over the past five years, an element that is largely played up for laughs but is no less smart in how its overall message is executed. While this is a solid sequel that does make efforts to expand this universe and its very likeable characters like a decent follow-up should, there still something that’s noticeably missing this time around, and that’s the true sense of fun and enjoyment. Make no mistake, The LEGO Movie 2 is a very entertaining movie, but it doesn’t feel like there’s as much passion or genuine love for the LEGO brand that Mitchell brings to this as Lord and Miller did when they were directing the last one; this feels like it exists mainly because the first film did so well, which is certainly the point of most sequels but there’s nothing as fresh or as truly awe-inspiring as what came before, so in that sense the film is a slight let-down. However, that just makes the movie a much more impressive effort; in my opinion, there was little to no chance of this one being nearly as good as the first, because The LEGO Movie was that rare film that struck gold on the very first strike, with clever writing, hilarious jokes and brilliant characters that you didn’t see a lot of in most other family movies around the time it came out, which made the challenge to follow it up even harder because it ended up being so beloved by critics and audiences. So, the fact that this movie actually manages to serve as a pretty solid follow-up that retains enough of the original’s sense of humour and generally loveable nature is perhaps the strongest compliment you could give to something that was already destined to score below its predecessor; it’s like when Ghostbusters 2 came out some years after the first Ghostbusters, and people responded to it well despite it being nowhere near as enjoyable as the first one. Even though this movie isn’t anywhere near on par with the first, The LEGO Movie 2 just about manages to recreate some of that glorious awesomeness. 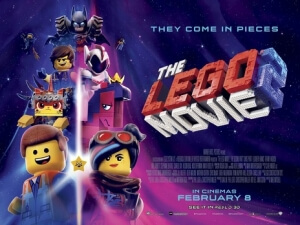 The LEGO Movie 2 isn’t nearly quite as awesome as its predecessor, but it retains enough of the sharp, clever and subversive humour, as well as its loveable cast of characters and a very smart script by original directors Phil Lord and Christopher Miller, that it’s perfectly enjoyable as a decent follow-up.